The M6100 switch series consists of Gigabit access layer and 10 Gigabit distribution layer switches in the NETGEAR modular chassis switch product line. The M6100 switch series offers high-quality, high-density chassis alternative to stackable switches in campus LAN and midsize organizations demanding networks. With more than 1.4 Tbps switching and routing capacity, passive backplane, management and fabric nonstop forwarding redundancy, the M6100 series delivers world-class resiliency and scalability. Ultimately, operating software and system management features take the complexity out of delivering L2/L3/L4 rich services for enterprise edge and SMB core deployments. 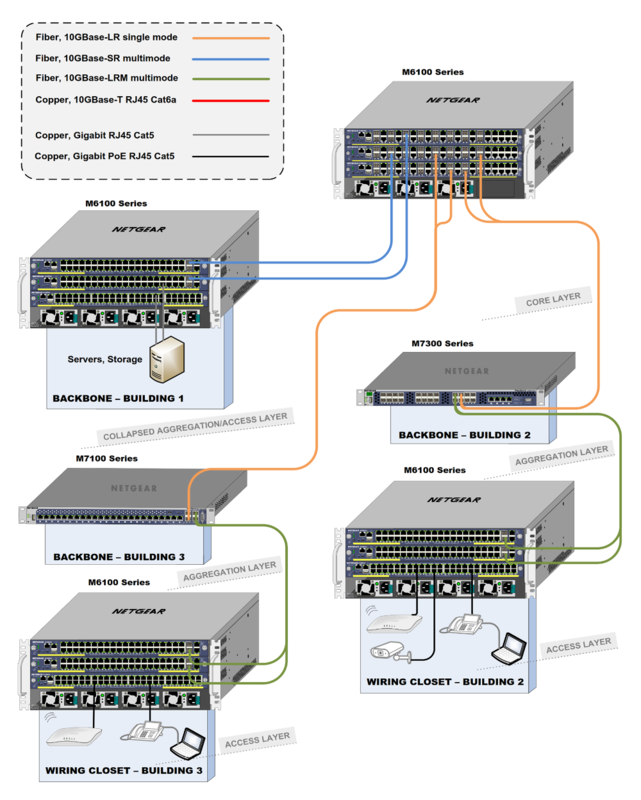 Each Line Card provides line-rate switching and routing capacity. Each Slot provides 2 x 40G channels (80G half-duplex /160G full-duplex) access to passive backplane. The new ProSAFE M6100 Chassis series is set to shake up how SMBs deploy high performance, highly resilient, fully redundant and future proof switched networks from the Core to the Edge - without hurting or exhausting IT budgets. Offering the densest Gigabit and 10G port solution in a 4U footprint, the M6100 is a fully distributed fabric, passive backplane solution with full management and power redundancy - as standard. UPOE capability extends its potential and delivers true investment protection to leverage today and tomorrow’s evolving powered devices. Designed for use at the center of a small to mid-sized organization, or as an aggregated or access solution in a larger campus or mid-sized enterprise branch network, the application scenarios for the M6100 are both wide and diverse. For those who require a resilient Gigabit connectivity option to the desktop or 10G for virtualized server and storage needs through to large IP camera surveillance environments, the M6100 provides the markets fastest backplane speeds with hitless failover to deliver enterprise grade service levels excellence for SMBs. Download the NETGEAR M6100 Series Datasheet (PDF). * This product comes with a limited warranty that is valid only if purchased from a NETGEAR authorized reseller and modifications to product may void the warranty; covers hardware, fans and internal power supplies - not software or external power supplies. Lifetime technical support includes basic phone support for 90 days from purchase date and lifetime online chat support when purchased from a NETGEAR authorized reseller.